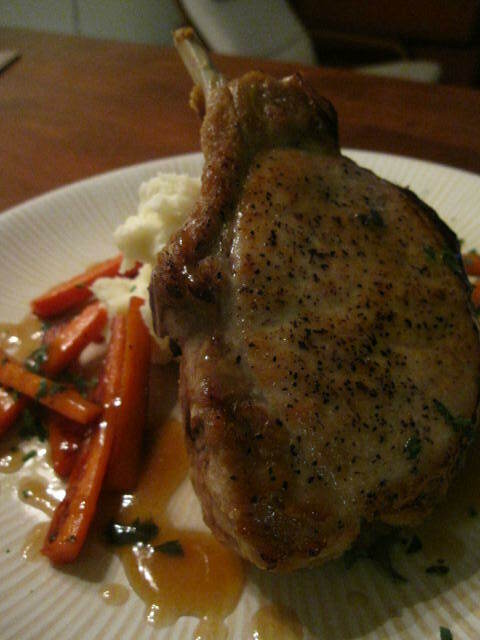 Seared bone in pork chop with ginger-cider glazed carrots and mashed potatoes. Blanch, shock and marinate carrots in apple cider, brown sugar, ginger, tarragon, salt and pepper. Season the chop with salt and pepper and pan sear over medium-high heat. Finish in 375 degree oven. For the sauce, deglaze the searing pan with a splash of chicken stock. Strain the carrot marinade into the pan and simmer. Thicken with a slurry. In a separate pan, heat olive oil and saute carrots. Serve over mashed potatoes.